Have you ever read a book that you couldn’t stand to finish? Not because it’s terribly written or the plot is flat. But you didn’t want it to finish it because, within the pages, you felt at home? Like you really belonged. That book is the fabulous Patti Hill’s book Goodness & Mercy. The novel is set during World War II (one of my very favorite eras to study). It’s about hopelessness, strong will, sacrifice, surrender, faith, fear, hope, family, war…I could go on all day. And I could sit and read the book over and again, too. Here’s one of the reasons I LOVED this book: It was true. But it was that kind of fiction that reflects so accurately the human condition, that it becomes a piece of life. Like ‘To Kill A Mockingbird” or “The Grapes of Wrath”. Now, my Great Aunts grew up in the era in which this book was written. Aunt Olga and Aunt Bertha were the ones I knew best. And, let me tell you, the stories they told (and stories told of them by others) about growing up in wartime made me a better person, just for hearing them. Because those stories taught me about strength and courage and jaw clenched determination. When I read “Goodness & Mercy”, I felt like I had my Great Aunts back. That they sat at our family reunions, sharing stories over French Silk Pie and my Aunt Bertha tipping her head back in laughter (she did that a lot). That is why I loved the book. “Goodness & Mercy” took me back, not to a simpler time. But to a more complex one. And it spoke to me and made me a better person, just for the reading of it. And, my friends, you have a chance to win a free download. This book is currently only available as an ebook for Kindle users (sorry, Nook Friends). If you win and don’t have a Kindle, I can help you download the app for your SmartPhone or computer. You know the drill (maybe). Click through the Rafflecopter link below to enter! Happy btdy (thats half the letters of happy birthday). Recently I read the forgotten garden that was pretty good. But nothings touched me as much as… Paint Chips… Love you. Oh, Jess. I love you, too. Thanks for the kindness. I recently read the Wednesday Sisters and loved it. So here is my question for you…is this just a kindle give away or a nook cuz I’m a nook girl. As of now, the ebook is only available for the Kindle. 😦 Sorry. So, I’m adding Wednesday Sisters to my to-read pile. Susie, in answer to your question regarding a book that I’ve read recently that made an impact on me, I’d have to say Ann Gabhart’s book, Scent of Lilacs. Based in the 1960s during the time I grew up I could relate to so much of what Ann described throughout the book. This is the second time I’ve read the book, and I think I enjoyed it even more the second time around. 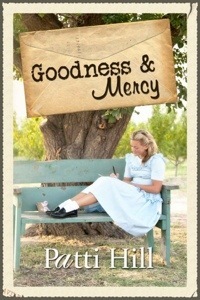 Goodness & Mercy sounds like a book that I would love! My mother and aunt grew up during World War II, and my grandmother told us stories of life from that time period. We now live in the house that my grandfather built when my grandparents and mother came to Grand Rapids from The Netherlands. On the main support beam in the basement is a gas ration stamp, I’m assuming placed there as a reminder of hard times. We also sat around at family reunions and shared our experiences together while savoring the greatest dessert of all time: French Silk Pie!!! Too funny! Oh, Nancee! We should get together for a slice of French Silk Pie!!! I love the image of the ration stamp. How vivid! This books is on my birthday list, but I don’t want to wait that long, so I hope I win. Hi, Patty! When is your birthday??? I recently introduced my friend to the Garden Gate series by Patti Hill. I own Goodness and Mercy for my tablet but I would love to win a copy for her Kindle. Hi, Linda! Thanks for stopping by. Isn’t Patti Hill just fabulous? She certainly is. I rarely buy books, and I have never read a book more than once, until the Garden Gate series. Now that my friend has read the series, and was talking to me about it, I guess I’ll be reading them again ( for the third time). Hm…I’ll have to look that one up. Thanks for stopping over, Denise! I would love to win! Love Patti Hill and all her books! Hi, Glenda! Patti’s remarkable, isn’t she?